In celebration of the 30th anniversary of the Platinum Maple Leaf, the Royal Canadian Mint is offering a set of fractional coins that share a unique design of three maple leaves. 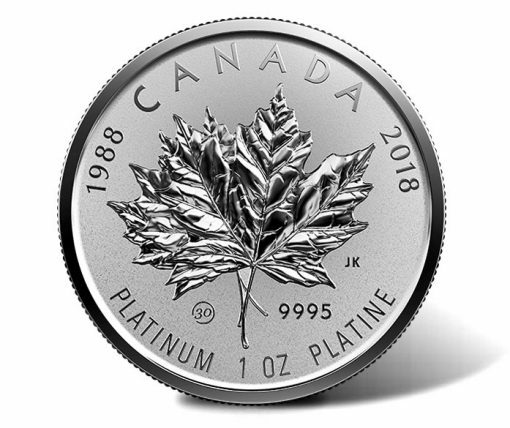 This image shows the reverse or tails side of a 2018 $300 30th Anniversary Platinum Maple Leaf. All coins of the set share the same major design elements. Included in the fractional set are 99.95% platinum coins that range in denomination and weight from $30 at 16 grams to $300 at 1.16 grams. "In 1988, we introduced the newest member of our bullion family: the Canadian Platinum Maple Leaf coin. Thirty years later, Canada’s annual platinum issue is still recognized as one of the purest in the world," the Royal Canadian Mint states. 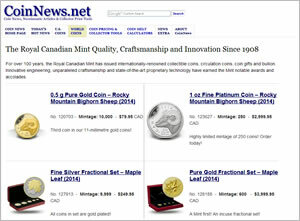 "The four coins in this 30th anniversary set share the same precisely engraved design of not one but three iconic maple leaves, which are carefully arranged to symbolize three decades of history that are forever preserved in 99.95% pure platinum," the Mint adds. 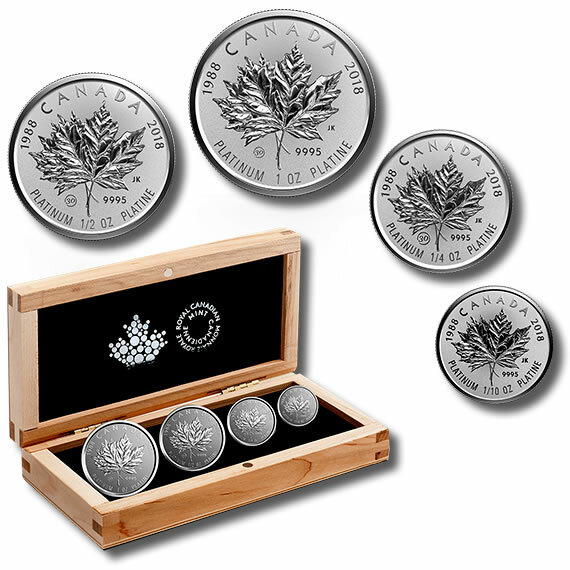 Designed by Jesse Koreck, around the maple leaves are inscriptions of CANADA, the double dates 1988 and 2018, the purity level 9995, PLATINUM, coin weights of "1 OZ, 1/2 OZ, 1/4 OZ, or 1/10 OZ, and PLATINE. A special 30 anniversary privy mark and the artist’s initials of JK complete the image. Obverses of each coin feature the Arnold Machin effigy of Queen Elizabeth II that appeared on all Canadian coins issued in 1988, the debut year of the Platinum Maple Leaf. 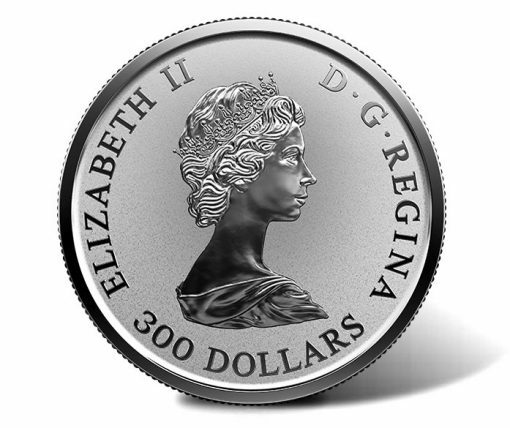 ELIZABETH II, D G REGINA and the coin’s legal tender face value are inscribed around the likeness. 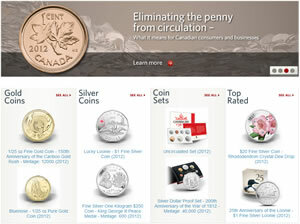 30th Anniversary Platinum Maple Leaf Fractional Sets may be ordered directly from the Royal Canadian Mint at mint.ca. Only 400 sets are available. Coins ships inside a Royal Canadian Mint-branded wooden presentation case.